The prototype system combines a thermal infrared and standard camera connected to a tablet PC (in the future, Metaio assumes, these cameras would be built into augmented reality (AR) glasses). For example, you could get directions by touching a static map in an airport, or get more information (video, etc.) from a book by touching text on a page. Metaio will demonstrate Thermal Touch at the 2014 Augmented World Expo in Santa Clara, CA, May 27–May 29. Metaio is offering a $200.00 discount with code METAIO4AWE at registration. 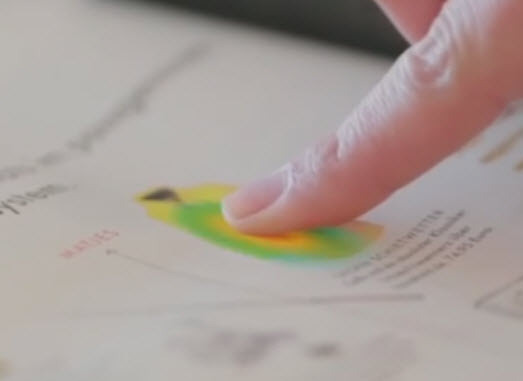 Thermal Touch is a vision of the near future for wearable computing user interfaces. By fusing information from an infrared and standard camera, nearly any surface can be transformed into a touch screen.